There comes a moment in every band’s life when they are forced to change either by choice or by circumstance. This is the time when they need to adapt to their surroundings in order to survive. 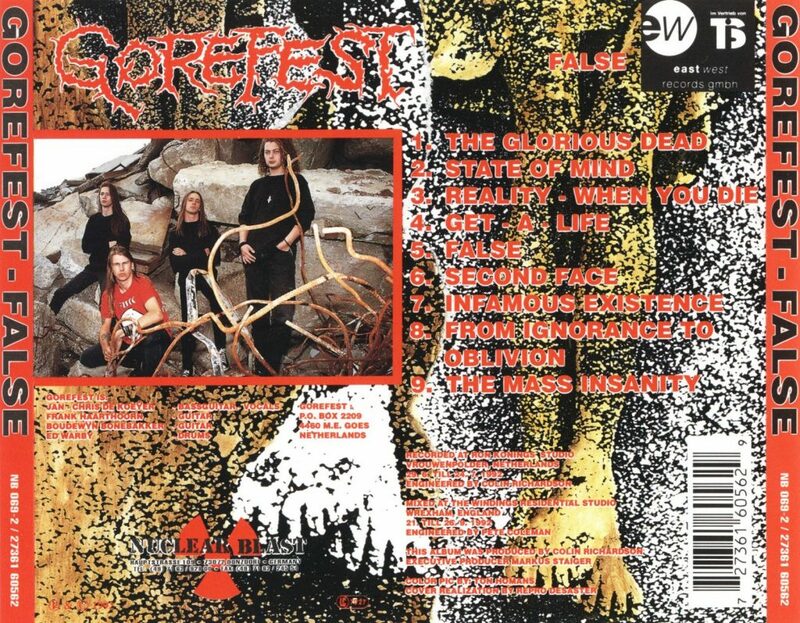 For Dutch band Gorefest that time arrived when they were set to write and record their second album “False”. The Dutch death metal mavens Gorefest had taken in new perspectives and ideas from touring regionally with the celebrated Carcass and Revenant, and their second offering was bound to reflect those new experiences. “False” - the band’s second full-length release - differs significantly from their “Mindloss” debut. Not only is this album more mature musically and lyrically, it also is the band’s most proficiently and professionally executed product up until that point with producer Colin Richardson behind the console providing his finest work. As a matter of providing the right amount of context and perspective we need to get some history out of the way first. Since “Mindloss” the band lost its rhythm section with the ousting of both main songwriter Alex van Schaik (guitar) and Marc Hoogedoorn (drums). There are conflicting reports on why exactly both members left, either by their own accord, or that they were fired from their positions. Sources note that van Schaik and Hoogedoorn were relieved of duty because Jan-Chris De Koeijer (vocals, bass guitar) and Frank Harthoorn (lead guitar) were dissatisfied with their level of musicianship. Other sources claim that Hoogedoorn was ousted due to a lack of interest. 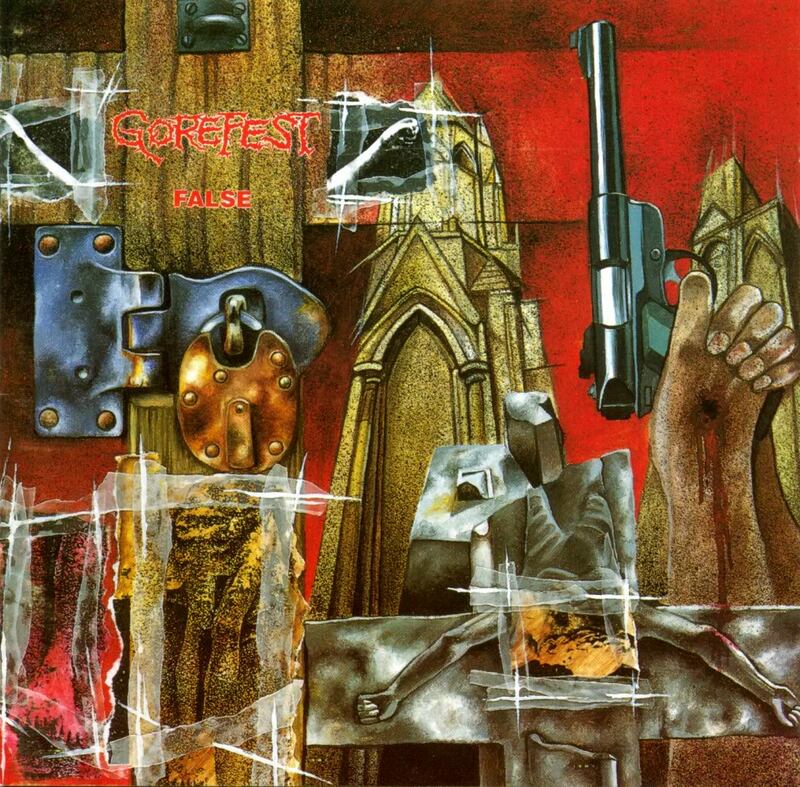 Whatever the case, Gorefest didn’t wane in the creative - and musical sense due to the absence of the duo’s input into the songwriting. In fact, their dismissal seemed to light a fire under the unit. Gorefest sounds more determined, more focused and hungrier than ever before. "False" was bound to sound different. Very different. “False” is notable because it is the writing and recording debut for lead guitarist Boudewijn Bonebakker, whose sparkling and melodic guitar work would come to characterize the band in the years to follow. Ed Warby, the new man behind the drums, came into the band a mere two weeks before recordings were set to commence. To say that his arrival was met with trepidation would be an understatement, as he cut his teeth in traditional metal outfit Elegy. Despite all these reservations the two new recruits make a spectacular debut. Bonebakker trades off leads with Frank Harthoorn like he had been doing it for years and new skinsman Ed Warby is ten times the drummer Marc Hoogedoorn ever was. Whether playing at breakneck pace, or doom-like dirge tempos Warby does all without breaking a sweat. Overall his drumming is more sophisticated, better arranged and balanced than Hoogedoorn’s one-dimensional beats. From the opening track ‘The Glorious Dead’ onwards one thing is clear. “False” is a far more structured and ambitious undertaking. Taking a cue from Carcass’ third album “Necroticism: Descanting the Insalubrious” the record opens with a sample, and the track itself is far more elaborate in construction and execution than anything this band has attempted prior. The riffing, while still primal and murky, is far more articulate and better phrased. There is a far greater reliance on dissonant chord progressions present, and the ancient thrash metal architecture has been fully abandoned at this point. Bonebakker’s presence brings the more traditional metal influence of Harthoorn’s writing to the surface, and his harmonized, neo-classical leads add a degree of intelligence previously unheard of in this unit. Warby’s drumming consists of a variety of styles and techniques that elevate the material tremendously in depth and texture. As hinted upon previously, “False” was more or less ahead of its time in 1992. The album is almost industrial in construction, with an emphasis on heavily rhythmic progressions and percussive density. The sludgy Autopsy/Cannibal Corpse sound is abandoned, in favor of a more streamlined, groove-laden approach to death metal that recalls Bolt Thrower more than anything else. The handdrawn artwork suggests a variety of topics the band deal with in their lyrics. Given that this album was produced by Colin Richardson (who had worked with Bolt Thrower, Carcass, Fear Factory, Massacre, Napalm Death and Sinister around this time) the production is evenly balanced for each instrument. The level of texture is deeper than it ever was, and the overall dryness of the whole production emphasizes the band’s rumbling low-end heaviness. The guitars possess a lot of body and are meaty, the bass guitar features more prominent than ever. The drums sound somewhat thin on the snares and toms, in my opinion, but they come with a level of clarity and definition not heard previous from this band. Jan-Chris’ vocals are less vomited, more grunted but a lot more commanding. They are actually incredibly well pronounced given what this vocal style would revert to in the decades to come. The profound influence of “False” would become clear years down the line as various metal bands would come to appreciate its structure and overall form. Fear Factory’s debut “Soul Of A New Machine” was built from the same template, Napalm Death’s “Fear, Emptiness, Despair” took kind to the heavy rhythmic progressions, and the percussive density. Sepultura’s artistic death certificate “Chaos AD” would experiment further with the industrial framework that this record introduced. Brutal Truth’s “Need to Control” takes lesser direct influence from this record, although their single ‘God Player’ clearly is a nod to the writing and song construction presented on this album. Just to say that “False” not only was an important record in Europe, in America it was seen and heard too, and many leading bands later recordings reflect that in their own output. Notable among these young hordes were Rebaelliun. Not because of their music, especially, as they were cut from a rather typical cloth of Slayer-meets-Morbid-Angel – but because of their do-or-die attitude. 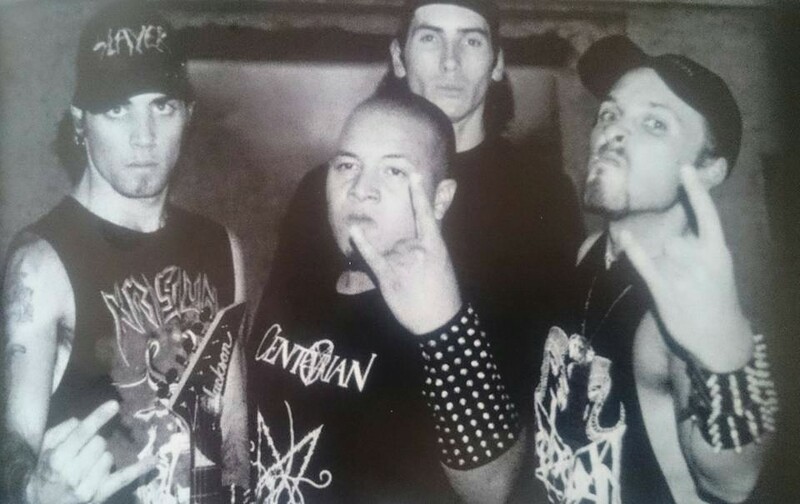 The fact that they had sold all their possessions (furniture, clothing, etc) in Brazil and moved to Belgium of all places to get a start in their productive but ultimately short-lived metal career, custodian only to a locally produced promo tape, speaks volumes of these men’s dedication. In one week they had secured their first gig, and based upon that very first gig (at the legendary Frontline club in Ghent) they were able to land a record deal with Holland’s Hammerheart Records. The popular consensus at the time was that Rebaelliun was just another Krisiun clone, and to an extent that is true. The difference with Krisiun is that Rebaelliun relies heavier on the influence of early Slayer, and their Morbid Angel leanings are only secondary to that foundational aspect. The point is also that Rebaelliun, even this early in their career, knew to how to arrange a song. Certainly, they play at blistering speeds most of the time but the dynamics are actually very clever for a genre as limited as death metal. The leads/solos of Ronaldo Lima were another high mark and selling point for this band. Of the two guitarists, Lima is more technically proficient and melodically gifted compared to the more straightforward approach of Fabiano Penna Correa. The band took the template of early Krisiun and worked their individual strengths around that basic framework. The result is an album that is savagely brutal, dynamic in composition but with an old school charm and warmth that was lost on Krisiun from “Ageless Venomous” onwards. While Sandro Moreira’s drumming is intensely hammering and mostly unrelenting, the way he incorporates fills, rolls and cymbal crashes is a lot more creative and engaging than anything Moyses Kolesne from Krisiun ever did at that point or later on. In a lot of ways you could see it as thrash metal drumming sped up to the standards of the then-emerging blast death movement. 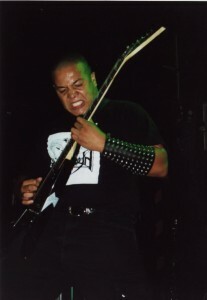 On lead and rhythm guitar is the pair of Ronaldo Lima and Penna Correa, both whose primary source of inspiration lies with Slayer and Morbid Angel. The opening riff to ‘Spawning the Rebellion’ is vintage Slayer worship and the track ‘Hell’s Decree’ channels “Covenant” more than once, to say the least. The leads and solos are mostly of the Hoffman era Deicide variety. Marcello Marzari’s vocals are more barked than grunted, and while his bass playing provides the band with the most of its heaviness, it isn’t exactly special or captivating. The bass playing is just typical doubling of the guitars and not much else otherwise. Another thing that Rebaelliun understood, and what Krisiun didn’t seem to grasp, is that playing a bit slower, or mixing up faster and slower sections, adds to the depth of the song. 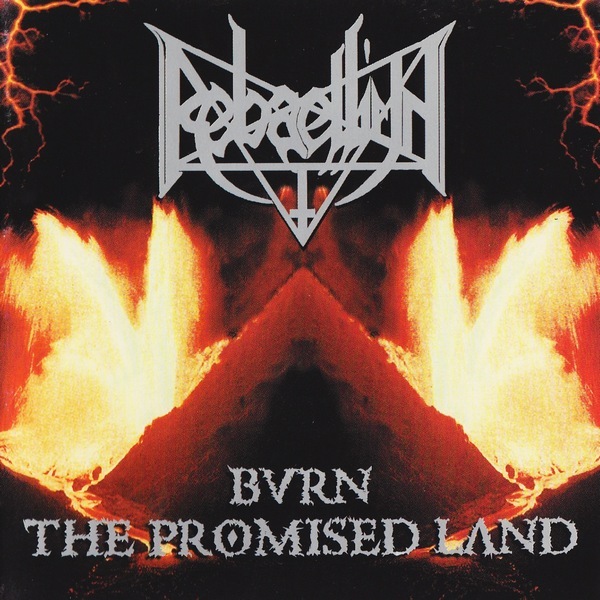 Where Krisiun has a very single-minded approach to how they construct and perform their death metal, Rebaelliun had no problems with letting some early thrash architecture slip into their formula. This, of course, is much more beneficial to the band in the long run. Occasionally there are guitar lead trade-offs, but these are hardly as prominent as those in Diabolic’s original three-album run in the early 2000s. The lyrics are far from compelling as they deal with the usual subjects of war, extermination and religious defamation. Not surprising when you consider this band hails from Brazil, who like Poland, are amongst the most religious conservative Catholic countries in the world. The album consists almost entirely of new and original material written specifically for this session. Outside of opening track ‘At War’ and mid album crusher ‘Spawning the Rebellion’ no demo tracks were refurbished. This is fairly logical considering that their “Promo Tape ‘98” consisted of only those two earlier mentioned tracks. Interesting is also the instrumental track ‘Flagellation of Christ (the Revenge of King Beelzebuth)’ which consists of spooky church organs, chiming funeral bells, sparse percussion and esoteric minimal guitar playing. The limited digipack of this album also contained the “At War” mini-CD, which was a single-CD limited repress of the band’s “Promo Tape ‘98”. There are no weak moments to speak of on this record, although towards the end the riffing tends to get a bit samey. ‘Killing For the Domain’, ‘Spawning the Rebellion’, ‘Hell’s Decree’ and ‘The Legacy Of Eternal Wrath’ are the strongest tracks of this session. The production work is of the old school variety, meaning that not everything is balanced and equalized to glossy perfection. Moreira’s drums suffer the most from the limited production, having the snares sound like buckets, with indistinct sounding kickdrums that despite their lack of clarity add much to organic feeling of the record. Marzari’s bass guitar is mixed deeply under the meaty guitars and doesn’t get much space in the production other than providing the deeply rumbling undercurrent and thickness. Like the erupting volcano that made up the album art for this record, Rebaelliun exploded unto the scene with finesse and conviction. In the wake of this record the band would tour Europe extensively, before recording another EP and finally a second album. After the touring campaign for their second album “Annihilation” Rebaelliun would fall apart due to a number of reasons. Years down the line Penna Correa would resurface with the more thrash-oriented The Ordher, Sandro Moreira would enroll in Mental Horror and Marcello Marzari would rejoin Abhorrence on a permanent basis. Little is known of what became of prodigious guitar player Ronaldo Lima, but the rumors persist that he stopped playing altogether after the Rebaelliun adventure ended as the band members returned to Brazil and all went their separate ways at various points.